Totm+Travl Bluetooth Apple Watch charging dock not only charges your Watch, but also interacts with other smart home devices using IFTTT. Like the idea? Let’s continue checking. The Totm+Travl is an innovative, app-enabled smart Apple Watch charger that works with both 38mm and 42mm models from all Apple Watch series. 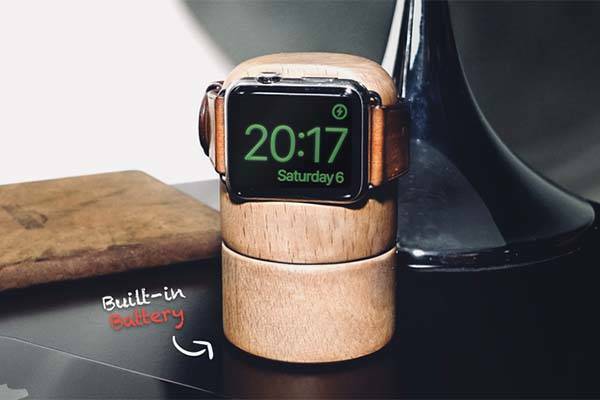 As we can see from the images, the Apple Watch charging stand features a minimal and sleek appearance design, and the compact, cylindrical form factor allows you to store it in your bag for easy carrying. Meanwhile, the charging stand is made out of a unique block of wood and sanded by hand and treated with a natural oil and wax in order to deliver a durable construction, gorgeous wood grain and a smooth and pleasant touch. The Apple Watch charging dock consists of two parts: Totm and Travl. The upper Totm features built-in cable organizer that keeps your Apple Watch’s overlong charging cable hidden in place and it supports Apple Watch’s NightStand mode for easy to view during charging. The Travl features built-in power bank that offers up to one week of charge, and its Dynamic Range feature provides a more efficient way to charge it. 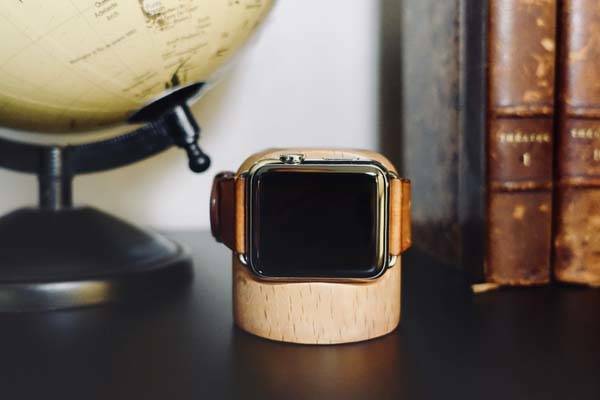 The Apple Watch dock also features built-in Bluetooth technology that allows it to wirelessly connect with your iPhone, and its custom app will remind you to charge your watch based on the status of the battery life. You can also check the battery level of the charger. More importantly, as a smart dock, Totm+Travl can interact with other smart home devices by plugging your watch, charge ends and unplugging the Watch. 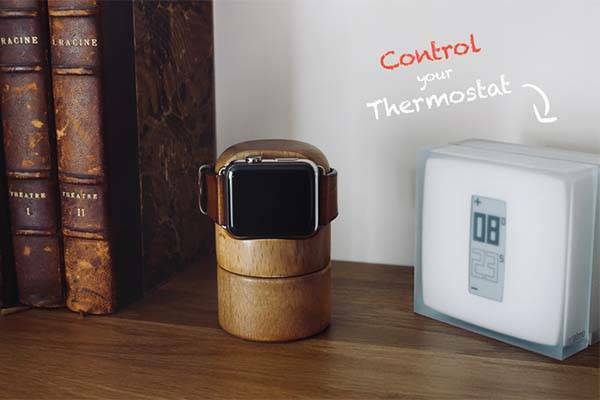 Using IFTTT you can create various interactions with the stand and other devices, for instance, when you unplug your watch from the dock, it will automatically disable your security system, or when you unplug the watch from the dock, it will automatically turn in a specific light. If reaching its fund stretch goal, a native Apple HomeKit will be integrated into the dock. The team behind Totm+Travl has raised enough fund for the product on Kickstarter, but we can still pledge €59 (approx US$100) to preorder the Bluetooth Apple Watch charging dock. It will be shipped in December 2017.